Repentance and the Resurrection: How regrets are redeemed. While I am thankful for every lesson I have learned through every wrong choice, and I am aware that God “blessed the broken road,” the hard truth is that I regret causing others pain. In fact, if you were to ask me my biggest regret, I could easily tell you the time and place. I was in my early twenties, at the funeral of someone I loved deeply, feeling like she had been stolen from me. Traditional etiquette required that I express my condolences to the family, but I would not. I could not. After all, I deeply felt like their adversarial relationship with the deceased had worn away at her will to live. In the end, cancer was the accused, but in my mind, she could have easily survived if her heart wasn’t already broken. In my mind, they should have been offering their condolences to me. In my opinion, saying nothing was actually the gracious thing to do. At least I am not saying bad things, I rationalized. Isn’t that how the saying goes? If you don’t have something nice to say, don’t say anything at all? In fact, watching my mother, with such genuine compassion, speak words like, “I’m so sorry for your loss,” confounded me. It almost seemed weak. It wasn’t till many years and several children later, in a conversation with a neutral party, that I could see the situation with more clarity. It was so obvious. Yet my pain had blinded me from even the most elementary observation. Several years later I humbled myself, and apologized for my prideful actions and in most recent years miraculous healing has taken place. Mistakenly, I had put myself in the judges seat, thinking I needed to punish them with my response, or lack thereof. I was wrong. And I regret that. I regret that at a persons most vulnerable moment, I turned my head, and missed the greatest opportunity to show Christ’s love. Recently I was faced with another crossroad of grace and judgment that brought me back to that fateful day. I needed to revisit my past response. What could I have done differently? I did not want to have this same regret again. Yet being insincere is not a viable option either. It is almost painful for me to pay a fake complement, or give undo accolades. I want my words to mean something. It was in that moment, deciding how to display grace in my present situation, that I received clarity about that day, so many years ago. I finally understood that what I needed wasn’t different words, what I needed was a different heart. I needed to see their loss as genuine, and their pain as real. I should have mourned for their broken relationship, now without hope for true restoration. I should have realized that I was no better than them. In fact, in a million ways, I was them. Maybe you are facing an awkward holiday celebration this weekend with some anxiety. Maybe there is someone that will be there who you would rather not see. How will you respond? 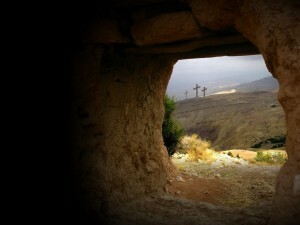 Have you ever thought about the first “Resurrection Day” celebration? Talk about awk-ward! Jesus enters the scene to a group of his friends, the friends that left his side when he needed them most, the friends who jockeyed for position when he would speak vulnerably about His death, the friends that fell asleep while he was sweating drops of blood, the friends that were embarrassed to know him as he bled and suffocated to death on the cross for their sins. Those friends. The comfort Christ spoke to them: Peace be unto you. This intimates in general that it was a kind visit which Christ now paid them, a visit of love and friendship. Though they had very unkindly deserted him in his sufferings, yet he takes the first opportunity of seeing them together; for he deals not with us as we deserve. 40 When He had said this, He showed them His hands and His feet. 41 But while THEY STILL DID NOT BELIEVE for joy, and marveled, He said to them, “Have you any food here?” 42 So they gave Him a piece of a broiled fish and some honeycomb.43 And He took it and ate in their presence. They saw him with their very eyes and still didn’t quite believe that He had literally and physically risen from the dead. Did he stop right there and rebuke their unbelief? No, he just said, pass the matzah! This would be an ideal spot for the application part of this lesson where I say, “See? Jesus was kind to people that didn’t deserve it, so you should be kind to people that don’t deserve it too.” But that would be missing the entire point. The reality is that if we are going to relate with someone in this story it would not be with Jesus, but with the disciples. We are the ones that have been faithless, we have chosen safety over supporting the weak, we have walked away when things got difficult, we have doubted the truths that Jesus has clearly expressed. We are the undeserving party guest. When we realize that we are actually the sinful offender, instead of the righteous offended, grace and love is the only natural response. Remember that while we sinned, Christ loved. Remember that he who has been forgiven much, loves much. Rejoice in your forgiveness. Understand that we love because we were loved. Repent once again, and pass the matzah! ← It’s time to pray, but what do you say? Oh, snap! Yes, indeed! I personally use the thought of saying “Told you so” as motivation to get things done. “Peace to you” doesn’t have the same biting ring to it. I have also too often been the sinful offender while nursing my wounds as if I was the righteous offended. Perspective is a powerful thing! Mozel!